The collared aracari is a tiny peculiar-looking toucan with a obvious and awkwardly-oversized bill. It can be commonly spotted throughout its 500,000 square mile Latin American region, and frequently seen at Anamaya Resort, where groups of aracaris are often seeing foraging through local fruiting trees. There are 14 known species of aracaris, all sporting slender bodies, vividly-colored plumages and curve shaped bills. None of them venture far from forested areas, and most are generally spotted in groups of about 5-15 individual aracaris. Collared aracaris seem to have a penchant for doing everything in groups – foraging, wandering and even sleeping. These birds are among the 16 species of Neotropical birds that display complex kinship behavior which includes cooperative care of offspring by non-parents. Research in Costa Rica confirms nestling aracaris are attended by up to 6 adults – 2 parents and up to 4 non-breeding offspring from previous births of those same parents. The non-parent helpers act as diligent care dispensers, bringing food regularly to nestlings and sleeping in the nest cavity along with the parents and nestlings. It is a cozy relationship, characteristic of collared aracaris, and researchers think helper behavior chiefly involves non-breeders that have not yet reached their breeding maturity. The helpers benefit by gaining experience as food-gatherers before they actually go about setting up their own nests and giving birth. As well, nestlings benefit from the attention of several adults. 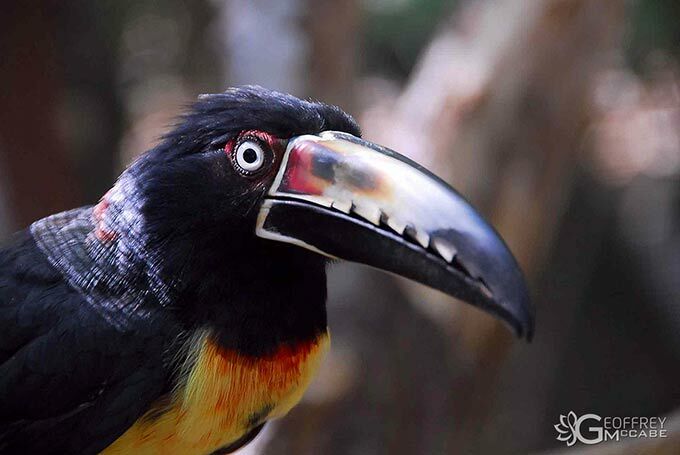 Similar to other toucans, the Fiery-billed Aracari is vibrantly distinguishable and has a large bill. The adult is typically 43 cm long and weighs 250 g. The sexes are alike in looks, with a dark colored head and chest and dark olive green upperparts, apart from a red rump and upper tail. There is reddish collar on the rear neck. The underparts are bright yellow, with a trademark round black spot in the centre of the breast and a red band running across the belly. The empty facial skin is dark, becoming almost flushed behind the yellow eye. The upper mandible of the bill is vivid orange, the lower mandible is black, and the legs are green. Juvenile Fiery-billed Aracaris are much duller in color, with a soot black head and brownish green upperparts. The red rump and yellow under parts are lighter, and the breast spot, belly band and bill pattern are barely distinguishable. Collared aracaris typically nest in empty woodpecker hollows, about 90 feet above ground, generally in the main trunk or a large branch of a neglected tree. About 4 eggs are laid at a time, which are incubated by both the male and female species in rotations averaging about 25 minutes. The young ones leave the nest after around 45 days. During the non-breeding period, the nest cavity serves as a sort of dormitory for parents and non-breeding helpers. Aracaris are not extremely vocal creatures. They have restrained, silent communication patterns. There is the occasional piercing alarm “shriek” that Anamaya guests will wake up to or which interrupt your sahavasana, but most of the time, these creatures are fairly quiet. They rarely display aggressive tendencies. Aracaris normally feed on fresh fruit, mainly Cecropia and palm, but they have a special liking for bananas. Sometimes, they are also known to feast on insects and tiny lizards. The Collared Aracari and the Fiery-billed Aracari are two of the most brightly colored birds of the toucan family in Costa Rica. Their behavior and biology is similar, and they have common ranges on the southern Pacific region of the country. Both are common within most of their ranges. Their distinct profiles are most easily spotted crossing between large canopies on the edges of clearings in the forest. They often produce a high decibel “cheep-eep’ sound as they fly. Both birds have the characteristic, strikingly large curvy bills that would be oddly heavy if they were not hollow and light. These species also have a slender body of medium size, a rather long tail and short, rounded wings. These are the only toucans known to rest in groups in trees throughout the year. Not only do the adults take care of the hatchlings until they are ready to fly, they actually accommodate them for long after they are capable of being on their own. Aracaris usually make their nests in holes that have been carved by woodpeckers high above the ground, from about 6 to 30 m high. Adults of both species have a shiny black-olive head, neck, and chest; the facial and frontal color patterns are also fairly similar. Both the species have brilliant yellow and red feathers on the lowerside with a wide band across the center. The Collared’s color is mostly black, while the Fiery-billed’s is red. The Fiery-billed has a distinctly larger black spot above this color band than does the Collared Aracari. The most distinguishable feature between the plumages of these sister-species is that the Fiery-billed has a bright spread of crimson, orange, and yellow over its bill. The Collared’s bill is less compex – the lower mandible black and the upper mandible mostly a dull, pale yellow with maroon near the head. The Collared Aracari is also slightly smaller in frame than the Fiery-billed and has a thin rufous collar around its neck that’s missing in the Fiery-billed. The Collared Aracari has a propensity to fly and forage through the middle and upper levels of forest canopies, generally in moderately open regions or old and second growth zones. They may fly lower where the forest is more open such as along forest edges, through gaps, or in nascent stages of the forest. In such open places, the intense sunlight causes some fruiting trees and shrubs to produce more of the food that the Aracaris eat. They forage and travel in flocks of 6 to 15 creatures, and during the night as many as 6 may sleep together in a single tree hole. Several adults (up to 5) may share caring for a batch of 3 eggs at a time. The Fiery-Billed Aracari tends to stay higher in humid forest than its collared counterpart, and can be spotted mostly in nearby clearings. They may still stoop to eat berries off the ground. Their groups tends to be relatively smaller in size, foraging in bands of about 6 to 10 individuals and sleeping together with 5 birds at most at night. Usually the 2 eggs in a batch are raised by 3 or more adults. The aracaris can be spotted at the Aviarios del Caribe, the Barra Honda National Park, the Cahuita National Park, the Carara National Park, the Corcovado National Park, the E.A.R.T.H University, the La Selva Biological Station and the Santa Rosa National Park. They can also be spotted at the Manuel Antanio National Park, Drake Bay Wilderness Resort, Los Cusingos, San Vito , Wilson Botanical Garden, Tortuguero National Park and eastern parts of Santa Rosa National Park. The Collared Aracari is commonly found in Caribbean lowlands and premontane forests. It cannot live in regions that are heavily deforested, and is not generally found above elevations of 1,000 m (or 1,200 m in the southeastern part of Costa Rica). On the Pacific side of Costa Rica, this bird is found only rarely except in more southern forests of the country. Our resort guests and visiting yogis often wake up to the sounds of the arcaris or can view them around the property while sipping their morning tea or while practicing on the yoga deck. Visiting yogis can also take bird watching trips around the Montezuma area to spot several fascinating species like the aracari. Bird watching trips led by expert guides are conducted all though the forest trails and national parks of Montezuma.